Ted Carmichael Global Macro: Why So Paranoid About Canada’s Housing Market? On February 2, the usually careful Financial Times breathlessly reported that “Pimco, the world’s biggest bond investor, has slashed its exposure to Canada – one of its top country holdings – as it predicts home prices will start to fall this year amid broader concerns that it could be the next global housing bubble ready to burst”. Mr. Ed Devlin, who oversees Canadian investments for Pimco, told the FT that “the fund has been bearish on Canadian housing for some time and expects a decline in housing activity and prices this year as mortgage credit tightens and borrowing rates increase”. The article goes on to say that, “banks, including Goldman Sachs and Deutsche Bank have pointed to an overvaluation of Canada’s housing market, but few large funds have been explicit about cutting their positions”. Sounds pretty scary, doesn’t it? But is it true? Has Pimco done its homework? Is there evidence that Canada’s housing market is more overvalued than those in other countries? Will mortgage credit tighten and borrowing rates increase in Canada more than in other countries? What will trigger a serious housing downturn in Canada relative to other housing markets? Many economists and urban planners use affordability indexes to determine whether housing is overvalued. The Demographia International Affordability Survey, which is in its tenth year, provides a wealth of up-to-date comparisons of median house prices relative to household income in major cities in the US, UK, Japan, Hong Kong, Singapore, Australia, New Zealand and Canada. The summary chart of Demographia’s research is shown below. 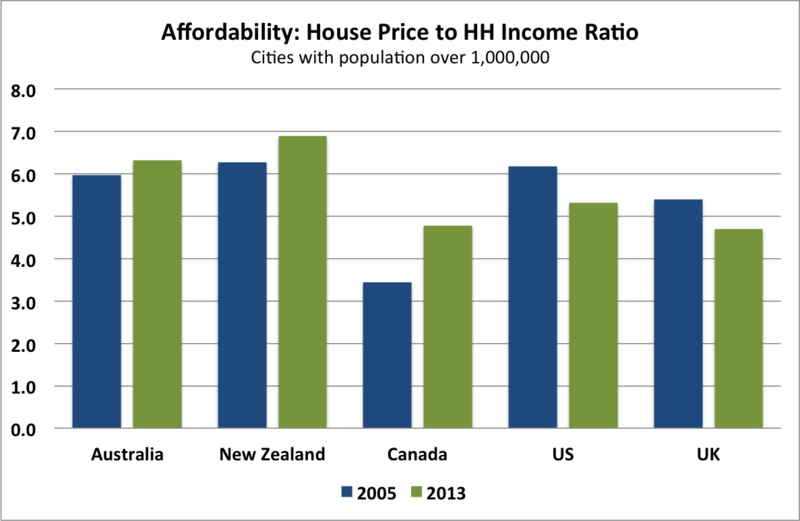 It compares affordability of housing in Australia, New Zealand, Canada, US and UK in cities with populations over one million included in the Demographia surveys in 2005 and 2013. Canada was the most affordable housing market among this set of countries by a wide margin in 2005, when the median house price of housing in Toronto, Montreal, Vancouver, Edmonton and Ottawa was 3.4 times the median household income in these cities. In the other four countries, the median multiples were 5.4 in the UK, 6.0 in Australia, 6.2 in the US and 6.3 in New Zealand. With the bursting of the US and UK housing bubbles in the financial crisis, housing median multiples have fallen in 2013, while in commodity-producers Australia, New Zealand and Canada, multiples have increased. While Canada's multiple has increased most, at 4.8 in 2013, it is still low relative to the other countries with New Zealand at 6.9, Australia at 6.3, US at 5.3 and UK at 4.7. How Do Cities around the World Compare? By this measure, Hong Kong (C$1150/sq.ft. ), London (C$750), Beijing (C$580), Singapore (C$460), Dublin (C$420), Devon (C$400), and Moscow (C$385) rank as the world's most expensive cities. Vancouver is the most expensive Canadian city (C$360), slightly less expensive than Moscow and slightly more expensive than San Jose, California (C$340), Sydney (C$315), and San Francisco (C$300). Toronto is Canada’s second most expensive city (C$245), slightly less expensive than Santa Barbara (C$270) and Melbourne (C$260), and slightly more expensive than Canberra (C$244), Auckland (C$240) and Oxnard, California (C$235). Calgary (C$210) is just slightly less expensive than Napa, California (C$220) and Tokyo (C$215) and slightly more expensive than San Diego (C$205) and Brisbane (C$195). Further down the list, Edmonton and Ottawa (both C$165) are slightly less expensive than Christchurch and slightly more expensive than Aberdeen. Toward the most affordable end of the spectrum, Moncton (C$77) is slightly less expensive than Willmington (C$79) and slightly more expensive than Cincinnati (C$60). The point of all of these numbers is that Canadian house prices are quite comparable to those in the US and many other countries. It is worth noting that Canada’s three most expensive big cities, Vancouver, Toronto and Calgary all placed in the top 10 in the Economist Intelligence Unit’s most liveable cities list as did three of Australia’s most expensive cities, Sydney, Melbourne and Perth. 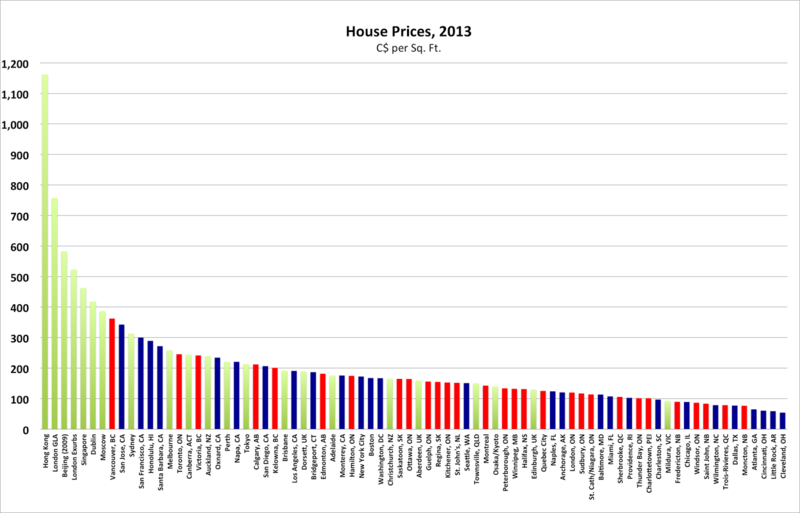 None of the cities that are more expensive than Vancouver, placed in the top ten. No US city placed in the top ten. This suggests that there is still good relative value in Canadian house prices. Why is Pimco so paranoid about Canada? Mr. Devlin argues that Canadian house prices will fall as mortgage credit tightens and borrowing costs rise. But global interest rates tend to move quite closely together and tend to be driven by movements in US rates. It doesn’t seem likely that Canadian housing prices will be hit any harder than Hong Kong, US, UK, Australian or New Zealand house prices by a generalized rise in global interest rates. Recently, the Bank of Canada has been more dovish than the US Fed and Canadian borrowing costs may move up slower than those in the US and UK. It is widely recognized that Canada has maintained more prudent lending standards than did the US and UK prior to their housing market downturns. What could trigger a Canadian Housing market downturn? A significant sell-off in commodity prices (possibly caused by a global recession or a hard-landing in China) that hurts economic activity and land prices in Canada’s resource producing provinces. Pimco is not forecasting any of these possible triggering events. Instead, it seems to be arguing that Canada’s housing market will roll over on its own. It is not clear why Canada’s most affordable cities would experience a sizable housing price correction. And it is not clear why Vancouver, Toronto and Calgary would experience a sharp downturn while Hong Kong, London, San Francisco or Sydney would not.